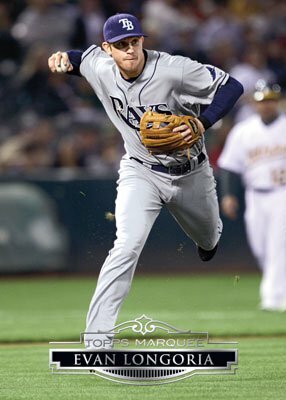 2011 Topps Marquee Baseball has several elements that are bound to entice hit-seekers with a slightly smaller budget. And by slightly, think $50 a pack instead of $100 or more. With several levels of multi-piece relic cards, book cards and autographed relic cards, Marquee might seem similar to the Topps Triple Threads line. Some common elements exist, but Marquee appears to be aiming for a cleaner, more toned-down design. The base set takes a minimalist approach that targets the photography. Relic cards stick to plainer swatch arrangements rather than spelling out names and random stats. At around $50 per pack, the set is pricey, just not quite as much as some other sets that offer similar content. One numbered autograph, jumbo relic or multi-relic card per pack. 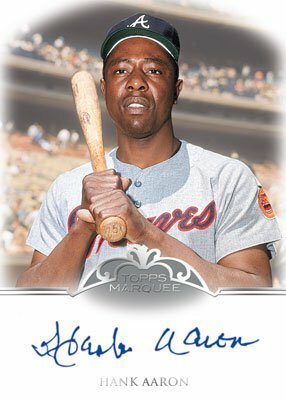 Monumental Markings Autograph Cards: Inserted one per box, the checklist includes 75 names including Sandy Koufax, Hank Aaron and boxing champion Manny Pacquiao. The cards are highlighted by elegant red foil. Each will be serial numbered. Gold foil parallels numbered /5 will also be made. Dual autographs featuring two autographs will be limited to 15 copies. Museum Collection Autographs: Signature on a metal-framed card. Inserted one per distributor case, cards will be numbered /10. 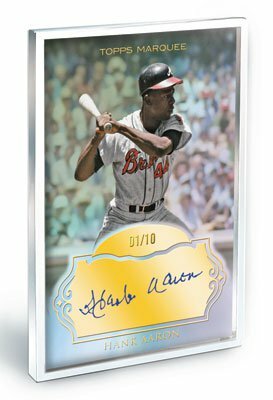 Acclaimed Impressions Autograph Multi-Relic Cards: Mixing autographs with two and three memorabilia pieces, these offer another deep checklist. Seventy-five dual relic cards and 35 triple relic cards make up the set. Parallels for both include a gold foil version limited to five copies and a one-of-one patch version. 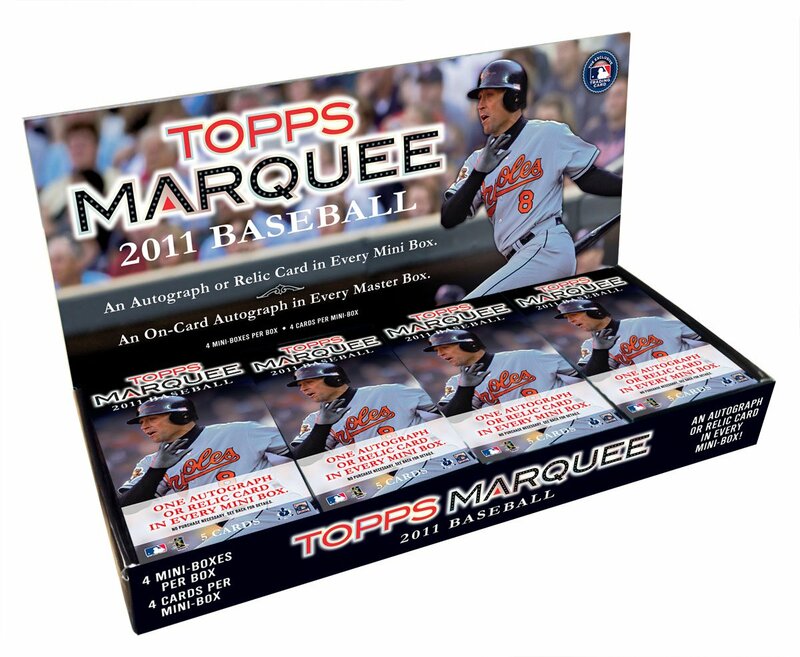 Jumbo Relic Cards: Inserted one per box, these memorabilia cards don't settle for dime-sized pieces. Titanic Jumbo Relics are numbered to 99 copies. With 130 players getting these cards, individual hits will be somewhat difficult. Gold foil versions will be limited to 10 copies each. 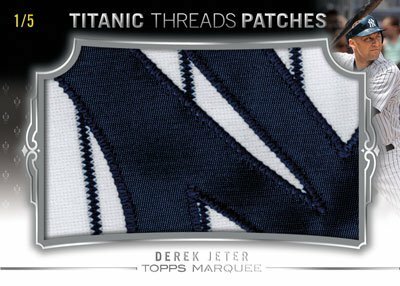 Titanic Jumbo Patch Relics, limited to ten copies each, add large multi-colored patches to the mix. Autographed versions, also limited to ten copies each, contain a player signature on the relic piece. More than 100 players will appear on these cards that have a print run of ten cards and will appear one per hobby distributor case. Ty Cobb Jersey Stitching: A one-of-one card that includes the stitched name tag from one of Cobb's jerseys. 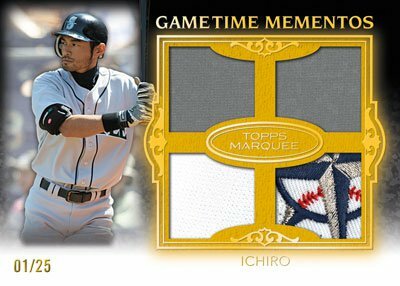 Gametime Memento Quad Relic Cards: Single-player versions are numbered to 199 and feature four memorabilia pieces. Fifty-five cards make up the set. Gold foil versions are numbered to 25. Autographed versions exist for 25 players, each limited to ten copies. Thirty-five quad-patch cards offer multi-colored pieces and carry a print run of five cards each. Eight baseball legends, such as Babe Ruth and Lou Gehrig, will appear on quad relic cards limited to 25 copies each. Gold foil versions numbered to five will also be made. 2011 TOPPS MARQUEE TITANIC THREADS JUMBO JERSEY NOLAN RYAN - TTJR-3 - 82 99! 2011 TOPPS MARQUEE TITANIC THREADS JUMBO JERSEY NOLAN RYAN - TTJR-3 - 52 99!